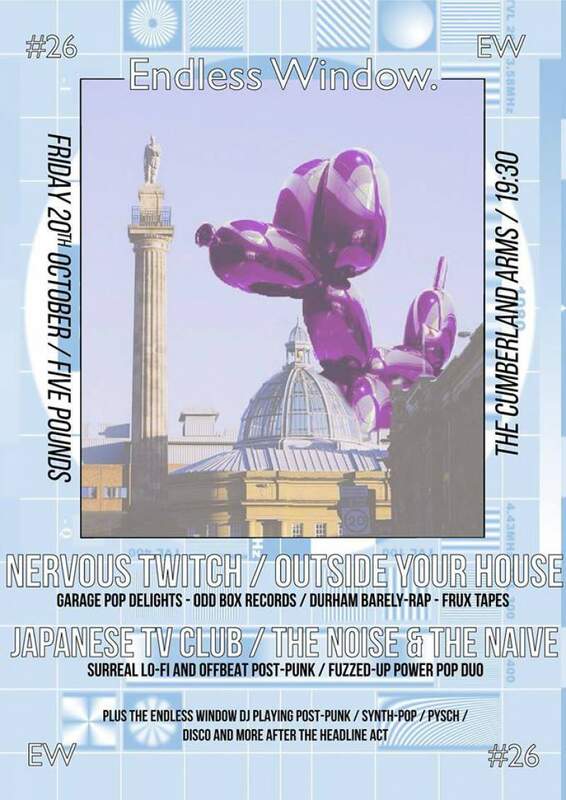 Kicking off Friday’s brilliant gig at The Cumberland Arms was local outfit The Noise & the Naive, a roaring punk duo who thrive on their incongruity. Their setlist moves from driving to crashing to swaggering to thrashing, not seamlessly but rather seeming to take pride in their seams. The duo sing and yell in a combination of English and their native French with an energy as gloriously abrasive as it is infectious. Following them were Japanese TV Club, whose sound is a slicker, more polished one with naturally ear-wormy hooks that would make them sound right at home on 6Music. It’s clear that this band’s natural ascent through the guitar pop ranks has begun. From easily catchy to utterly absurd, Japanese TV Club were followed by Durham’s Outside Your House, an almost-avant-garde duo consisting of a spoken word poet and just about every synthesised instrument under the sun. Their lyrics, delivered in a voice reminiscent of Jarvis Cocker’s mumbling on songs like I Spy, are comprised of interesting phrases aesthetically cool and hinting at meaning, though often as part of a whole they make little to no sense. Musically though, they’re very creative and write good enough hooks for even the most random of instruments not to seem unnecessary or pretentious. Headliners Nervous Twitch bring the night back to a wonderfully punk-ish close. Their 60s pop-inspired garage punk is achingly cool, and all around the audience are murmurs of “irresistibly catchy” and “impossible not to like”. Both of these seem like understatements for Nervous Twitch, with their insanely good and genuinely unique hooks, and their retro aesthetic and language employed in deliciously punk I-Don’t-Care lyrics. If this industry has an ounce of justice, everybody who’s anybody will be talking about Nervous Twitch in a matter of months. They are ‘why-isn’t-everybody-already-talking-about-them’ good.